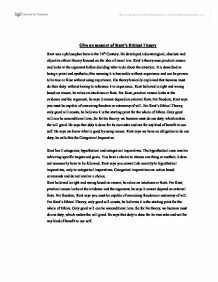 Give an account of Kant's Ethical Theory Kant was a philosopher born in the 16th Century. He developed a deontological, absolute and objective ethical theory focused on the idea of moral law. Kant's theory uses practical reason and looks at the argument before deciding what to do about the situation. It is described as being a priori and synthetic; this meaning it is knowable without experience and can be proven to be true or false without using experience. His theory basically explained that humans must do their duty, without having to reference it to experience. Kant believed in right and wrong based on reason, he relies on intuitions or facts. For Kant, practical reason looks at the evidence and the argument, he says it cannot depend on external facts. For freedom, Kant says you must be capable of exercising freedom or autonomy of will. For Kant's Ethical Theory, only good will counts, he believes it is the starting point for the whole of Ethics. ...read more. Only good will can be unconditional love. So for his theory, we humans must do our duty, which makes the will good. He says that duty is done for its own sake and not for any kind of benefit to our self. Kant gives 3 different formulations of the basic moral principle. The first is acting as if you were legislating for everyone. This means that you should considerer whether the thing you want to do, could be made to be a universal principle applicable to all people at all times. Unless you can will that everyone should act this way, it is wrong. You must act as if your laying down a universal law of nature, imagine that your decision was one taken by God. It would affect everyone, so you should treat it as a law for everyone to follow not an exception for yourself. The second formulation, is act as if your treating people as a means and an end, never only as a means. ...read more. With Kant, the value of the action comes before the action itself, and these rules apply to everyone. It is about duty, not feeling or inclinations and is therefore the equivalent to the golden rule, do unto others what you would have them do to you. With this theory it leaves no room for human rights to be exploited. However despite these strengths there are a number of weaknesses; this theory is about the abstract, and cannot be applied to moral situations. Thinking about the result of the action, is an important part of the decision making, so this is a weakness because you cannot always predict the result of your action. This theory also does not help understand the conflict between duties. In conclusion, I feel Kant's theory is a clear and well thought out one. Despite its flaws, I believe it is one of the easiest of theories to follow. I believe nobody can be an exception to it and that if everyone followed it, they would produce a world of equality and freedom. This would be a hard rule to enforce though, as some peoples idea of 'the right thing' could be the 'wrong' for others. ...read more. 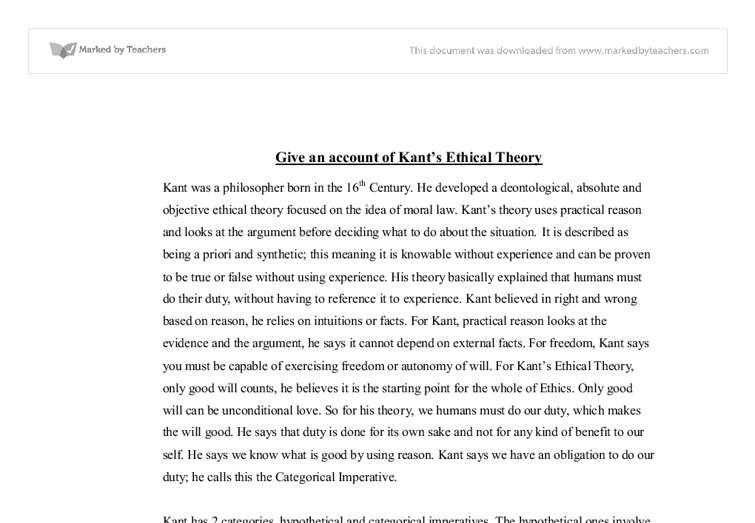 The student includes a lot of descriptive points and shows a good familiarity with the terms involved in Kant's theory. These points typically get some of the gist of Kant's theory, though are often mistaken. Significant attempt at evaluation is made, though most of these attempts misfire and/or display a lack of understanding of Kant's theory. The student contradicts themselves quite frequently. Also these attempts at evaluation do not take the form of arguments, but often are just stated without explanation. It focuses on the general rules that everyone should follow so the greatest good can be brought to the community. A rule utilitarian will focus on that a person shouldn't give a false witness even if it is to save a lot of people as a general rule, the rule should take priority over the immediate situation. If we are talking about God, and if we regard God as the source of existing things, then we could say that God is not a being. Another way of making this point is to deny that the cause of existing things is in a genus or is a genus. as an analogy of the world, seeing as both possess clear signs of design, intricacy and purpose. The main reason why so many believe that this theory has no credibility is the total lack of supporting evidence. Of course this is some what irrelevant in Plato's view as the whole premise of his theory is that there can be no evidence, as sense experience is to be totally disregarded. A material object, such as a basketball, has many properties: roundness, ballness, orangeness, elasticity, etc. These are all put together to make up this individual basketball. A form is just one of these properties, existing by itself apart from space and time. He believed that we when we followed our conscience we were following some kind of divine law like a messenger from God. He believed that he could prove this when ?we feel responsibility, are ashamed, are frightened at transgressing the voice of conscience, this implies there is One to whom we are responsible.